1) Open all nine JR615 using PL490 and PL491. Use each of these oval jump rings to attach a charm (no order) about every third or fourth link on BR618. Close each of these jump rings securely after they're on the bracelet. 2) Cut four 2" pieces of SR024. Using PL490, fold the last 1/4" of the piece of wire onto itself. (This will keep the beads you thread on the wire in place) Thread on one seed bead and one AC6370. Repeat with the other three pieces of wire. Choose four places on the bracelet (keep this random, you don't want to space these out the exact same distance between one another). Secure the bicones to the bracelet by making a wrapped loop with the remaining wire. If there are more than three loops, you can cut off the excess wire with PL495. 3) Cut six 1" pieces of wire and just like in the last step, fold the last 1/4" of each of the wires onto themselves. Now, with these, you'll thread on one AC4395 onto each 1" piece of wire. Again, just like in step #2, choose six randomly spaced places to affix these crystals and attach each to the bracelet with a wrapped loop. 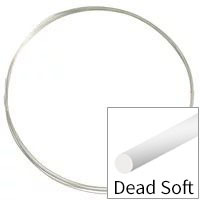 Trim any excess wire with PL495. 4) Here's where the fun comes in! 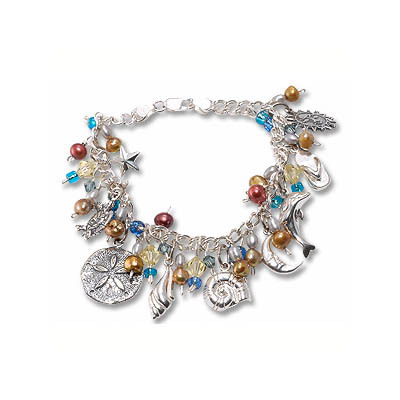 With the wrapped loop technique down and all of your beads and wire in front of you, attach the rest of your pearls and seed beads to the bracelet in different combinations. 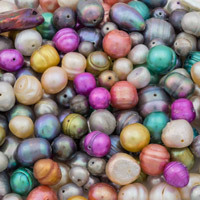 For some, you may want to only have one larger pearl, on others, a pearl and a seed bead. The more combos, the more exciting the bracelet becomes! Take your time and make sure your wrapped loops are nice and secure and you'll want to wear this seaside beauty all summer!